I’m a fairly conservative dresser, and I’m pretty short, so I tend to avoid any kind of print that could get me mistaken for a sofa, drapes, or the target of an African hunting safari. But I did recently buy a $8.99 snake print blouse at Ross, and wore it to work with a black pencil skirt from Target. Honestly, I felt fierce (although I guess I could have confused that feeling with menopause). If you’re feeling the desire to buy something a little edgier than usual, I highly recommend slithering a snake print item into your working wardrobe (but nothing that will get you a memo from The Wardrobe Police). Or you could try a beautiful snake print scarf if you want to make less of a commitment to the look, and also retain the option of abandoning it the minute any co-workers look at you askance. 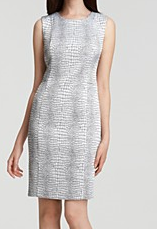 Calvin Klein Snake-Print Jacquard Sheath Dress ($129) ~ A lot more than I like to pay for a dress, I can still see getting a lot of wear out of something this classy, yet modern. This print is so lovely. It’s the first time I’ve ever longed to curl up anywhere close to anything resembling a snake. INC International Concepts Top, Sleeveless Scoopneck Silk Snake Print Ruffle Hem Tank ($29.99) ~ Of course, you can just let your inner cobra peek out a little from a classic black jacket. While I wouldn’t wear this blouse to a job interview, it would make a great day to evening look if you have plans to go out on the town after work. The neckline is modest enough, silk is luxurious and polished, and the flat ruffles provide a chic tailored detail. My boring black suit longs to make a connection with this blouse. 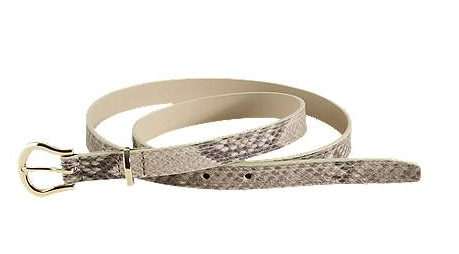 Cole Haan shows how it’s done for $58, but you can beat the price at your local discount fashion retailer.